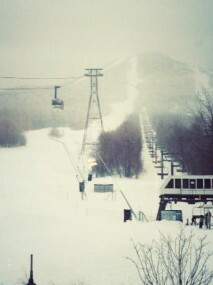 We went out of town after Christmas to ski at Jay Peak, VT. It was fun to be away for a few days and to hang out with the family. We went at a good time, as about five feet of snow fell on the mountain during the past week. Frankly, I needed the break from work. I consciously tried to rest my thoughts and to slow down my pace. We were surprised and glad to find that the lodge gave to us a room which viewed the mountain. Here is a photo from our balcony. A winter wonderland. We drove back yesterday, and we all said we enjoyed the trip. But, it felt great to come home. A vacation may be fun, but there’s just something about “home”: the comforts of a bed to which you’ve grown accustomed, the warmth of a familiar place, and the unique sights and scents that you associate with your living space. It’s good to be back. I’m cooking dinner now and enjoying the college football games that are on. Best wishes to all for a safe and wonderful New Year.